So… you’ve gotten that über gizmo for Christmas, ate far more than you should have, and got to see long-lost friends and family, but you’re still not satisfied. I know you all too well. Unless your über gizmo is installed with a varied assortment of metric sockets and spanners in the garage, while drinking beer with buddies, you are undoubtedly thinking about how you can manage to sneak some new car modifications past your significant other. See, I told you that I know you… all too well. You see, there’s a common theme amongst us performance driving brethren (and sisters); we all want to eek that extra 10th, whether it means lightening your car, installing the newest and hottest, finding extra horsepower, learning new techniques, or minimizing your belt size (save this one for your New Year broken promises bin). This series will delve into various options that will gain you a few 10ths while keeping some $10s in your wallet. I loved the first few seconds of this new Mini Cooper ad. Empty city streets, fast turns, lurid slides, engine revving up - yeah, this is going to be good! The paratroopers made for some interesting shots and the "live" slalom was pretty cool. But hey, does the car really need to go 15 feet wide to avoid the "live" cones? If you're going to put together a slalom, show some handling precision and get close enough so the car can clip the chutes with its side mirror, you know what I mean? Not a sports car was stirring, not even Ferrari. In hopes that Hot Nick soon would be there. Had tucked in the Lotus, and then hit the hay. We raced to the window, my dear wife and I. Gave the brightness of noonday to objects below. But eight tiny Fiats, pulling a sleigh. Good for me these great iRacing laps don't always transfer to real-life lap times but wow - that MX-5 Cup Car will beat me at every track except for the Glen where we'd be about even. Kart enduros are team events. Unlike individual races where you are ultimately responsible for all your decisions, everything you do during a kart enduro is designed to help the team. I did a quick write-up and put together a helmet cam video of my first kart enduro here. Today we are covering kart enduros in more depth. In nearly identical karts all weighing the same, driver weight is crucially important. To take out any weight advantage, all teams participating in a typical enduro are weighed before the event. If needed, karts are assigned weights designed to equalize the total weight between teams. After the drivers’ meeting, all teams go out for warm up/qualifying laps over a period of 15-20 minutes and the best qualifying time from any of the team’s drivers decides the team’s grid order. The karts have enough gas for the entire race but there are 7 mandatory pit stops for driver changes over a typical 90-minute race. There is no upper or lower limit on the number of laps that everyone on the team must do. Christmas Special: Red Bathtubs on Sale! Comes with Scissor Doors And a Decorative Ferrari Wheel! Think of the tarp as a condom for your date: it's not an exciting item to bring to the date but it comes very handy at, ugh, critical peak times. Tarps prevent equipment loss just like condoms prevent minivans. A few years ago it poured the entire 3 days at a Watkins Glen weekend I was attending. It was so bad, a little stream was running through the South paddock for most of the time. I was only using plastic crates to store my track items and could not save all of them. The original cardboard box for my jack got soaked and totally fell apart. It's not an expensive item but good luck finding a sturdy replacement box with the same dimensions. (I ended up making my own.) Many of the items in my toolbox and crates got wet too and since they didn't completely dry up for a couple of days until I got home, I had to throw out a few of them. 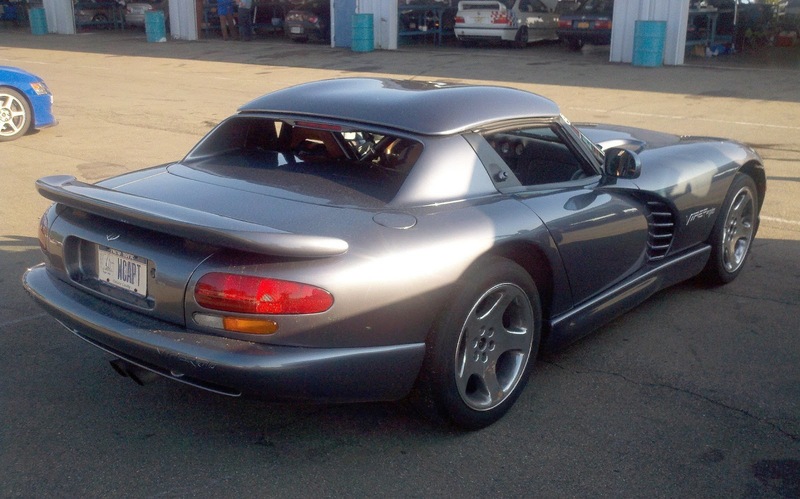 Quick: what's the fastest way to lower a Mazda RX7? Well, pop all the wheels off at the same time of course! "One, two, three, four, we're shy one. We need one... Only missing one, man!" At Lime Rock, a good lap would be close to a minute; at NHMS, maybe 1:20; At Tremblant, around 2 minutes; even at the Glen, it’s under 2:30. At the Full Monty, a good lap is anything under THREE minutes! During my first full course lap at Monticello, I realized too late there were no cars in front of me to follow and after a few minutes I started thinking I might actually get lost on the track. Ugh, does anyone around here have a GPS I could borrow? Today One Hot Lap's contributors tackle the manly task of shoe shopping. So many brands, so many styles, what to get? And which features should you consider? 1. The sole should be thin enough so you have a good feel for the pedal under your foot, but should be rigid enough so your foot is well supported. 2. It should have enough grip to not slip around the pedals, yet not be too sticky for switching pedals easily. 3. The sole should curve around the heel to allow you to rest your foot on the heel. This prevents notchy foot movement and that translates into smoother driving. 4. Ideally, the outside of the right shoe should be covered in rubber to protect it during heel and toe maneuvers. Is this a Polish autocross? Serbian Track event? Some sort of European Gymkhana? Looks like they haven't invented cones over there yet but the old tires come in so handy, they even stack them up! And what happens if the little Suzuki loses control going flat out in the 90-degree left turn and crashes into the oncoming car, which is also moving at pretty decent speed? Paging All Track Geeks: Gran Turismo 5 to Re-Create Real-World Laps! Not surprisingly, GT5's graphics look better than the real world's! If you live in the Pacific Northwest (PNW) and you like to take your car to the track, life is good these days. As you may recall, we recently reviewed one of the new PNW tracks, Oregon Raceway Park, and it was good. News came out recently that another brand new track is about to open for business next year and it is generating some serious buzz amongst PNW track junkies. The track is looking like it's going to be phenomenal: 16 corners and some serious elevation changes. Everyone is trying to figure out how and when to get on it. 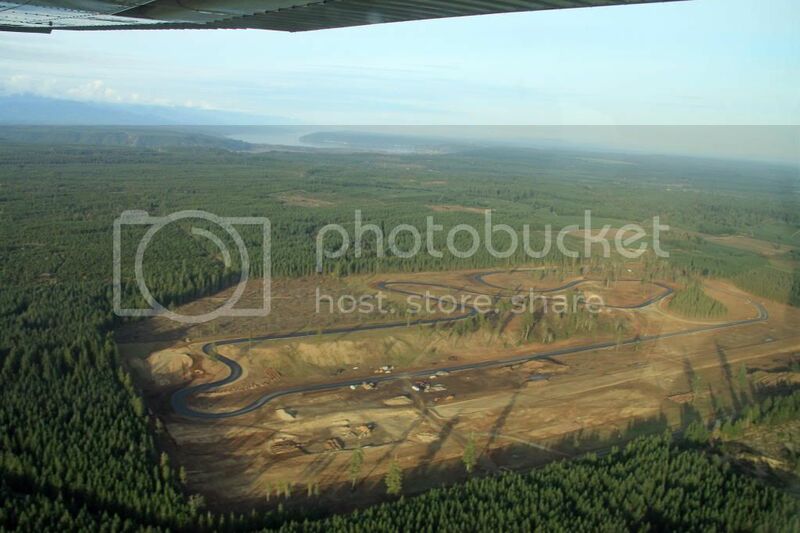 The new racetrack is called The Ridge Motorsports Park. It is in Shelton, WA which is on the South side of the Olympic Peninsula, a little under 2 hours from Seattle. WCVB-TV Boston is reporting another Corvette crash, this one right under our noses here in Boston. According to the report, "Police said a woman driving a Corvette came out of a dealership on Route 1 and lost control, causing the car to flip and hit a pole before landing upside down." What I really want to know is this: was the driver wearing scantily clad clothing and was she yelling "Go Daddy, Go Daddy!!" right before the crash? 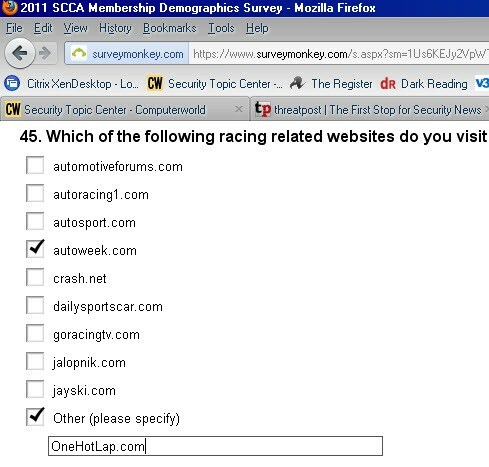 1) OneHotLap.com cannot afford these cars. 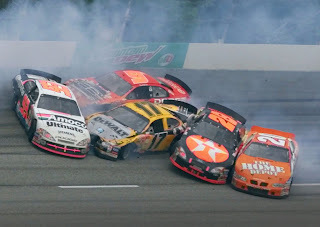 2) OneHotLap.com drivers NEVER crash!! So you probably know the details of the crash by now: $4 million-worth of supercars, highway crash, eight Ferrari F430, a Lamborghini Gallardo, 3 Mercedes -- plus a Toyota Prius -- among the vehicles involved, etc. What I really want to know is this: how the hell did a Prius end up in a crash of 12 supercars?! Did it have supercharged batteries? Here's a fantastic hands-on lesson from the immortal Colin McRae, all while racing on narrow roads! I love it how calmly he speaks at these crazy speeds -- as if he's talking about how to bake cookies. It's a sign of greatness when you can drive on the ragged edge and still have a ton of brain power left to explain how oversteer and understeer work! Rule #1: if you don't know how to control a car, at least keep the wheel straight when accelerating. Or maybe that stripe got in the way? And did you hear someone from the crowd go "It's alright, dude?" Is this how they encourage the idiot driver after he crashes into random cars on the street during Mustang Week? If It Isn't Snell Approved - It's a F#cking Salad Bowl! The sticker reminded me this article on helmets is still a great read for anyone looking to replace their helmet in the upcoming season! Corner workers in the middle of the course just a few feet from gates, one of them even crouching instead of standing, people walking around casually, light poles without any markings (let alone protective padding), and a 3-foot-high curb at the edge of the course mere 30 ft from a fast section. What could go wrong? And another car is STILL running out on the course almost 20 seconds after the 'Vette's crash. Not a single red flag in sight. Too bad this 'Vette owner ended up paying a hefty price for the organizers' stupidity. The OZ wheels on my 325i during the '05 One Lap of America. 17x8 OZ Superleggera wheels. Used to be silver when new. Probably somewhere in between anthracite and black with all the brake dust baked into them now. Look fantastic if you don't wash them, especially from a distance! According to this Press Release form Nintendo, West Coast Customs "has re-created two vehicles from Mario Kart 7: the classic Mario Standard kart, complete with glider attachment for soaring through the air, and the Luigi Bumble V kart, which resembles a bumblebee and features a rear propeller for underwater navigation." After an exhaustive search and experimenting with substances (most of them legal), we are glad to report that we have discovered the secret ingredient to keeping your wheels clean: PAM cooking spray ($2.86 for the 8-oz bottle at Walmart). Empirical evidence showed that if you leave your race pads on the car for 2 months and never wash the wheels, the brake dust still comes off as long as you spray the wheels with PAM before the dust gets there. Crank up the Volume for the Jeremy Clarkson Beatbox!! 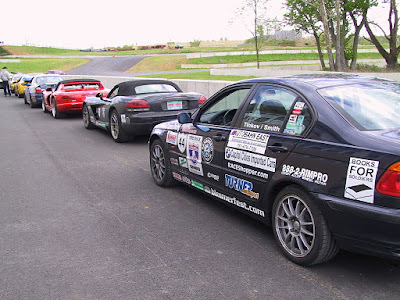 I want a ring tone that goes "powerslide, powerslide, powerslide, powerslide..."
Lime Rock's Christmas Special: A Grand a Day to Drive Your Own Car!! How about driving your own car on a world-famous race track? For $995, you can drive your own car at high speed - with a private instructor sitting "right seat" - on Lime Rock Park's iconic race track. This is the first Pikes Peak run under 10 minutes, which also shattered the previous record by over 10 seconds. Watching the first few seconds from the run reminded me of those car commercials where the advertiser speeds up the footage to "convince" you the car is really fast. "Watch how the Mercedes C class would look at 160 mph if it was going FOUR times faster!!!" Except this run is for real. Totally insane driving and fantastic car control!! And those spectators are just as insane standing only a couple of feet from a car drifting at triple-digit speeds on loose surface! The squirrel's tail looks a bit shorter and sits much lower after this 100+ mph run-in with an LP670-4 SV at an Ultimate Lamborghini Experience event. I had a very similar encounter at 140 mph right in the middle of the braking zone for the Bus Stop at Watkins Glen this last September. Ironically, that was the same weekend this squirrel story broke out. Luckily, the squirrel moved out of the way just in time and never got a free haircut from me. East Coast and California track junkies are a fortunate few: They have a ton of good choices when it comes to race tracks. Lime Rock, VIR, Laguna Seca and Thunderhill are just a start. OK to Flip. Just Don't Slip!! What can happen in one and a half minutes of driving? My friend Jamie Melhuish is about to find out in his 2011 Mt Philo hillclimb below. I love it how calm the checkpoint guy looks when the car went off right in front of him at 0:37. No need to get off the chair in a real hurry, it's only 3,200 lbs of metal coming at you really fast. And did you see the squirrel having lunch right in the middle of the road at 0:58? Jamie had to wrench the wheel to dodge that squirrel, which barely moved at the sight of the car. Maybe it's one of this story's survivors who have been trained in performance driving since birth and are totally unfazed by another race car zipping around! To autocross or to ice race this weekend: that is the question! You have probably seen the Turner Motorsport banner to the right of this post by now. Group code "ONEHOTLAP" gets you 5% off the entire TMS store, every day, no exceptions. This discount is exclusive to onehotlap.com. Clicking on the Turner banner and adding items to the shopping cart automatically applies the discount to your entire purchase! As a rule, we will only add site sponsors with products that we like from our own experience. One Hot Lap is all about performance driving and we will only recommend companies that make positive impact at driving events. Turner hits bull's eye with their performance products and performance-oriented service approach. We expect nothing less from the 2011 Grand Am Driver and Team championship winners! 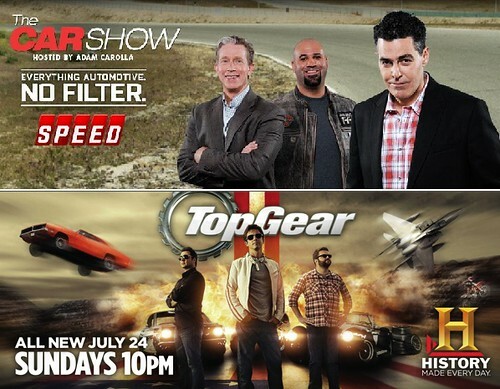 Let’s get straight to the bottom line: Both shows are trying their hardest to emulate Top Gear UK. Like many gearheads, I am a huge fan of Top Gear UK. The show is phenomenal with entertaining and witty commentaries, breathtaking video editing and a budget with seemingly no limit. I have actually managed to turn my wife to it so I don’t have to sneak out of bed in the middle of the night to watch it. She enjoys it, which speaks to the show's broad appeal: 40% of its viewers are women. I found a good Read on the 1M from WSJ's Dan Neil Here. 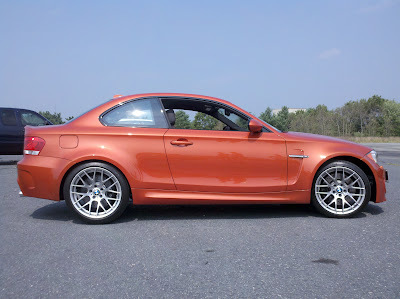 1) The BMW 1M and the M3 do not have an electronic limited slip. Only the 135i does. 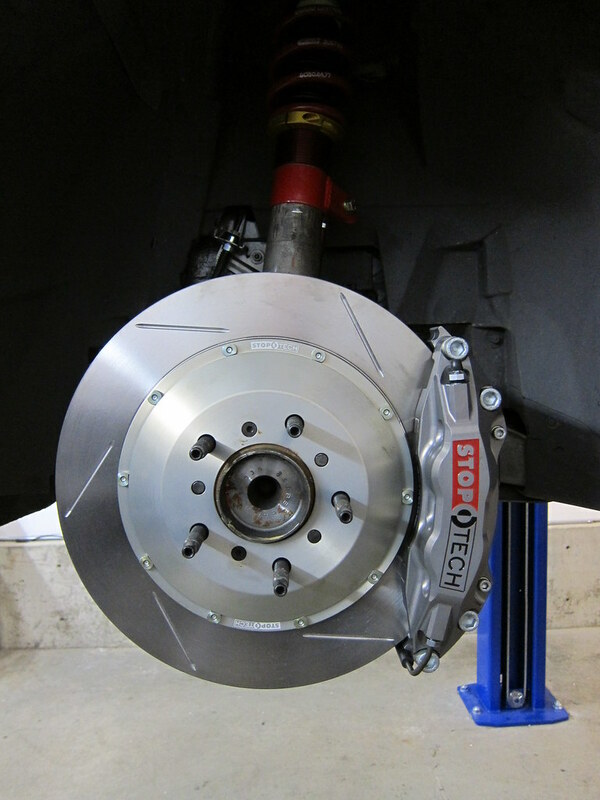 A mechanical limited-slip is far superior and it is the performance driving enthusiasts really want. 2) The 1M is not 77 lbs lighter than the 135i. The BMW Owner's Manual lists the 135i at 3,298 lbs. At 3,362 lbs, the 1M is actually 64 lbs heavier than the 135i. When you’re ten years old, everything in the world seems new and exciting. Your dreams are endless and you feel as though you could do anything. As you get older, your dreams may get more grounded, but you are always in search of that excitement you felt as a kid. The fact that you’re reading One Hot Lap means you’ve likely found performance driving, or even just the simple act of driving, to provide that same sense of joy and even invulnerability you once felt as a kid. This is not to say that racers are impervious to the risks involved in motorsports. It's just that there is a particular happiness found in straddling the limits of adhesion overpowering any potential for injury that may exist. Imagine every time you sneezed or hiccupped, you had to go see the doctor. It cost you $120 or so, a few hours of lost productivity, and probably a lot of worries (good thing the diagnosis was good and the doctor said you were OK!). This, for the most part, is how the "Check Engine" (or “Service Engine Soon") light works in most modern cars, except you go to see the dealer. I first saw the “Service Engine Soon” light on my 2001 BMW 325i just a day or two after I installed the first modification in it: an aftermarket cold-air intake. The warning looked ominous to me and it freaked me out. Did I just screw up my engine? 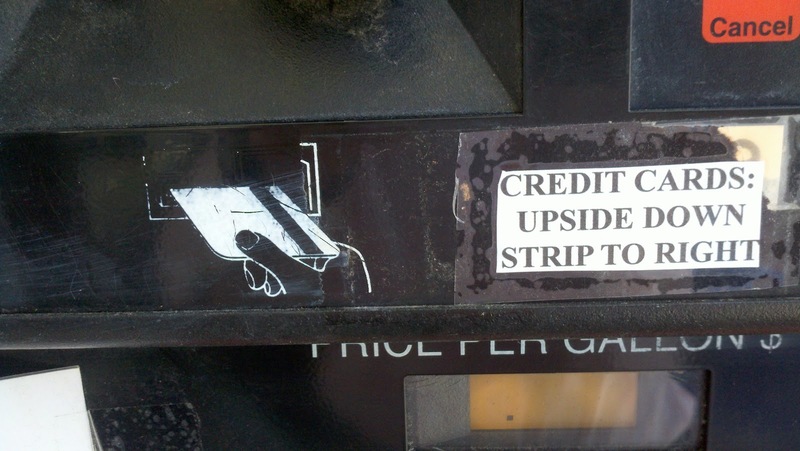 And how do I “service” it? I went to the dealer on the next day and they said the code that had been triggered was related to an “out of range parameter: impermissible air range”. I checked the intake again and I was convinced it had been correctly installed. I knew many other 325i’s were running it and had no issues with it. The car exhibited no drivability issues and after a few days, the light disappeared. To this day, the light still comes back every once in a while when we get the first cold weather spell each Fall and then it clears itself out. 10 years, 100 track days, nearly as many autocross events and 170K miles on the engine later, the car is still running as good as new. The 1M did very well right out of the box! My Write-up on the Track Weekend at Tremblant Is the Cover Story on Boston Bimmer!! 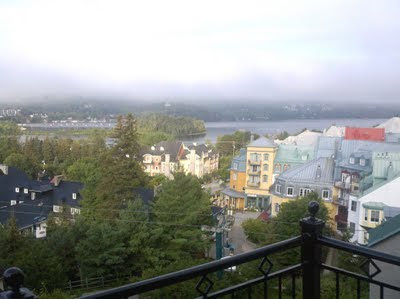 My family’s plans for our annual pilgrimage to Mont Tremblant were as sound as ever: pack the night before, have a nice breakfast together, leave just after rush hour and get to Montreal before 3 PM when they close off one of the highway lanes going through the city. Our execution was as bad as any other year: sleep late, pack the morning of the event, have Trail Mix in the car for breakfast, leave too late, and get to Montreal right smack in the middle of rush hour. Hey, look at this: they’ve got another autocross course set up all over the damn bridge. Same layout as any other year: a 3-mile slalom! What do you do while stuck on the bridge for over an hour? Let’s see if we can figure out why so many people here drive small cars and everyone smokes cigarettes … Trust me, it’s a much better option than jumping off the friggin' bridge! This video has everything I like about road racing: close action, similar cars, masterful driving, tight battle in the final laps, and lots at stake at the end of a 6-hour race. Watch to find out if Garth Tander will be able to hold off Craig Lowndes. If you are looking for a shorter version, skip to 11:00 and watch just the last two laps. These are the best five minutes of road racing I've seen in a long time! I read that these Australian V8 Supercars are coming to the U.S. in the next couple of years. This type of racing would be really exciting to see live! Mark Dudek lived on canned food and Ramen noodles for his first year out of college in order to save for the best handling, most powerful and most lightweight car he could afford. He settled on a nice BMW Z4 roadster, possibly because it also shows off his biceps well. Mark has been autocrossing regularly for two seasons and won his class back to back against some very tough competition. Winning the Rookie of the Year Award along the way, he is on track to win the Driver of the Year Trophy out of hundreds of drivers this year. In this video, you'll find me inviting him to talk about his ride's setup and how he is able to drive it so well. He has no idea we had arranged for a high heels clad hot date to go in for the kill. Relentlessly focused in front of the camera, he doesn't even flinch, brushing her aside so he can get back on topic. Are you reading this Andretti, Ganassi, and Penske? This driver has the skills, he is marketable and he would never be distracted by any of the hot pit babes that would inevitably surround him at every big race! 15 teams competed in F1 Outdoors' 90-minute karting enduro in East Bridgewater, MA this Sunday, October 2, 2011. Team OneHotLap qualified kart #10 fourth on the grid and picked up a spot during the race to take a podium finish in its historic team outing. The event organizers did a stellar job over 90 minutes of clean racing. One-Trick Pony No More! Five Simple Ways to Be a Better Driver. If you've had any interest in motorsports you've probably heard the name Skip Barber. The now 75 year old retired racer started the Skip Barber Racing School in 1975 and began amassing a reputation for being one of the premier schools in the world. The alumni list is impressive with Formula One, IndyCar and ALMS drivers all crediting the Skip Barber programs as integral to, if not the start of, their racing careers. So about a month ago I finally bit the bullet after years of saying I would sign up for a Skip Barber racing school. Excellence comes at a price and I always cited the intimidatingly high price as the reason for my procrastination. The irony is that I've absolutely spent the same amount, if not more, each year on High Performance Driver Educations (HPDE). But the all in one shot price was intimidating. We had invited Eva Mendes to the official unveiling of Team OneHotLap's GoPro camera at our recent BMW CCA track event. Since she turned the offer down, we had to go with our second best option: OneHotLap's Real People, Real Cars. Batman's Lamborghini: First Aventador Arrives in the Northwest U.S. I just had a chance to see the brand spanking new Lamborghini Aventador LP700-4 (exact model name!) at a weekly exotics gathering in Redmond, WA, just outside of Seattle. 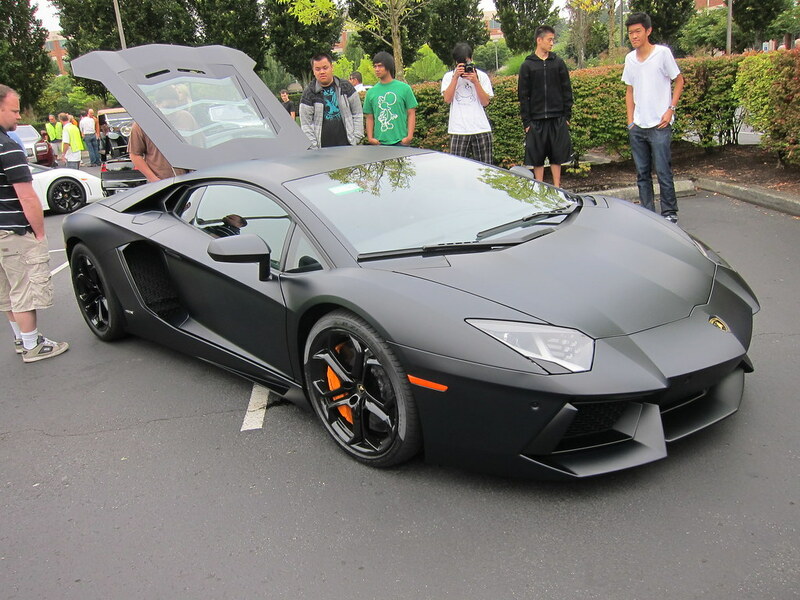 The Exotics at Redmond Town Center event is the Northwest version of LA's famous Cars & Coffee. 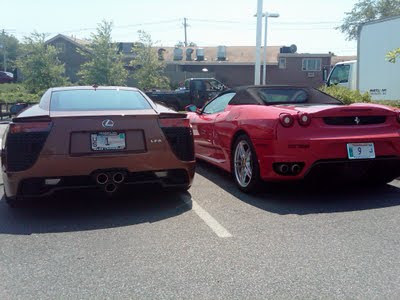 In fact, it's so popular that it's become the largest car gathering North of California. 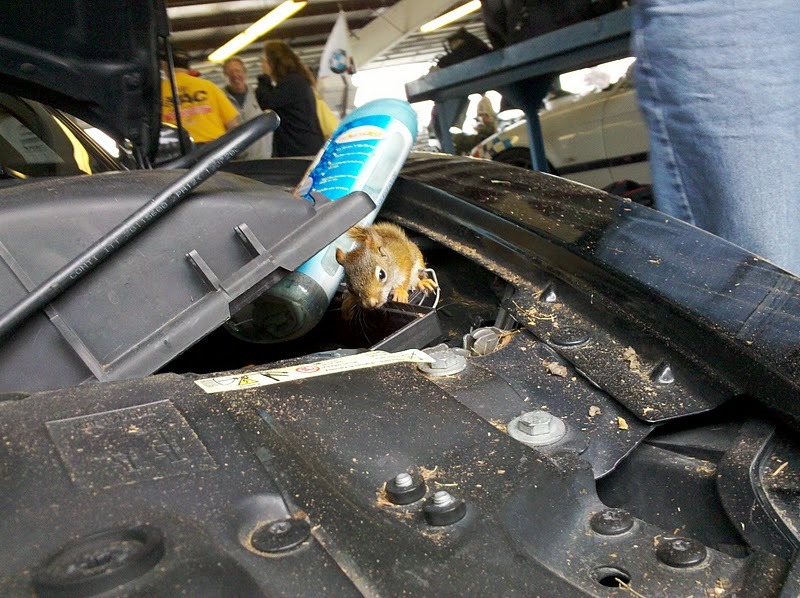 After two BMW CCA driving school sessions at Watkins Glen Int’l, an event participant complained about the car feeling a bit “squirrely” out on the track. When he popped the hood open to investigate a possible cause, he found acorn leftovers and critter poop all over the engine bay. 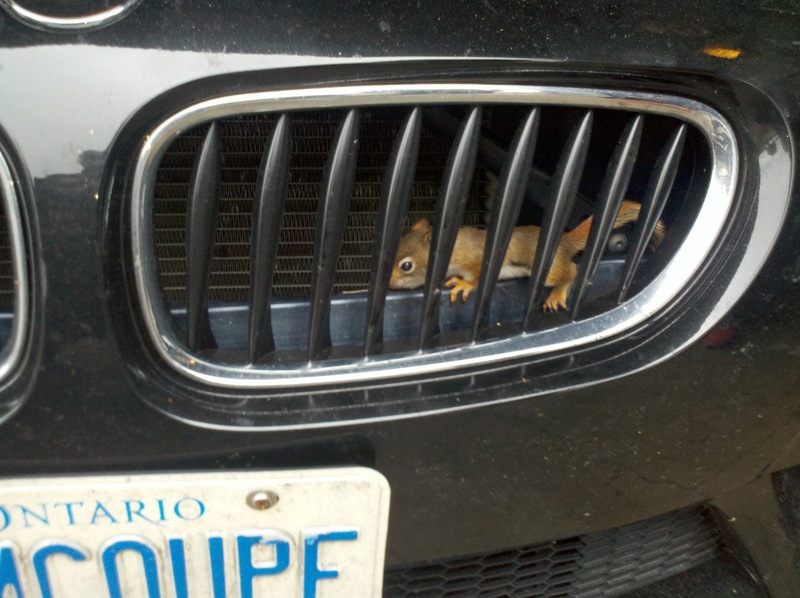 Upon further examination, it was determined that 6 baby squirrels had turned the car's airbox into their home and had been smuggled from Toronto through the U.S. border. FTD went to the '07 911 GT3 RS a.k.a Kermit. I think the SMIG will do well at the autocross in his new BMW E30 M3. Actually, scratch that. He will do VERY, VERY well! One Hot Lap of 2:13 Around Watkins Glen. In a Daily Driver!! Spotted: Ferrari FXX. Fastest Production Car In the World Around a Racetrack!! This is one of only 30 Ferrari FXX ever made and it sat right in front of me on pit road at a recent track weekend at Tremblant, Canada. It had a crew of two mechanics standing nearby, periodically checking the torque in the center lug nut on each wheel and keeping the car spotless, so it would be ready for its owner. 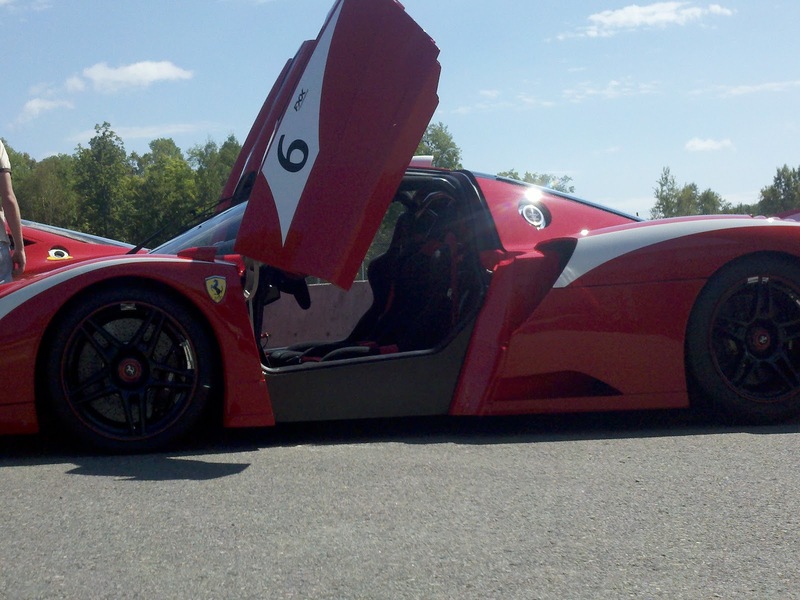 You have to be on a very exclusive list of Ferrari owners to be allowed to purchase the FXX for approximately $2,000,000. 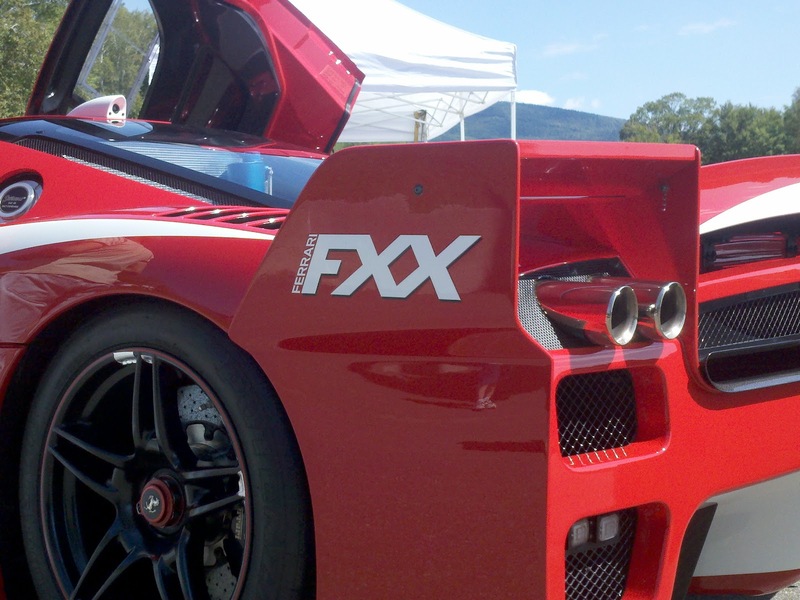 However, since it is technically a development car, you still have to keep the FXX at a dealership, maintain it at the factory, and make arrangements with the dealer each time you need to have the car shipped to your next track event. A Google search on “iPad” returns 1.3 billion results. A search on “brake pad” returns only 17 million results. Our collective knowledge of brake pads then is almost 1,000 times less than our knowledge of the iPad. This in spite of the fact that the iPad has been around for less than two years and the brake pad has been around for decades. are worthy of an exhibit at the Guggenheim. “Actually, it’s my 10-year old helmet. The loaner helmets are all new and MUCH nicer”! Over its extended lifetime, my helmet had picked many scratches and chips in the paint. Most of the foam piece around the eyeport had torn off. It had probably been dropped on a couple of occasions. And, well, the interior smell could probably give a raccoon a headache. I Saw My First Bugatti Veyron In Person Today. Stunning! Fastest production car in the world! ... And none of these numbers begin to describe the feeling you get when standing next to it. Here is a slideshow video from Boston/Quebec's BMW CCA high performance driving event at Le Circuit Mont-Tremblant, August 26-28. These spectacular pictures were taken by professional photographer Pierre Goyette who did a fantastic job shooting all run groups from various corners of the track on each of the 3 track days. This is just a small sample from Pierre's album. High resolution pictures from the event can be provided on request. Pierre's contact info is on the last slide of the video. Special thanks to our friends at Veloz Media for their expert help with producing the video. Enjoy! It's Official! Beyonce Buys SMIG's Racecar. The SMIG Travels Back To the Future With a Real M3!! Rumors that SMIG's hugely popular racecar has been sold have just been confirmed. Our site had earlier reported that the car was only undergoing a Beyonce to Taylor Swift conversion here. It is not presently known if the new owner will retain the triple exhaust trunk routing configuration or the single exhaust configuration reported earlier here. The SMIG has swiftly moved on to purchase Will Turner's personal 1988 E30 M3, which has won at Lime Rock Park, Pocono, Watkins Glen, New Hampshire, New Jersey, VIR, and Mont Tremblant and has finished 1st in 95% of its race starts. I was very fortunate to get behind the wheel of a brand new BMW 1M at the last autocross event. A friend had just decided to buy one on a whim (I always look forward to my big birthdays too!) and stopped by a dealer to see if they had any. It turned out that someone had just cancelled an order and a 1M was available to take home same day. He was incredibly gracious to let everyone in sight at our event take the 1M for a drive on the street even though the car had only 200 miles on the odo. First impressions: looks more muscular than the 135i with its bulging fenders, signature M quad exhaust and M treatment inside and out. If you drive with enough awareness of your surroundings, you've probably developed a particular knack for spotting cars on the road that aren't being piloted with very much skill. You know the scenes. The Crown Vic driver taking the car's boat-on-wheels persona quite literally by gently floating between lanes on the highway. Perhaps the Lumina that suddenly snaps to attention in the left lane after driving onto that insane rumble strip. Someone obviously dropped a Juicy Juice in the back seat. Or maybe the entirely too tinted G35 tailgating some generic vehicle in the slow lane. We avoid these semi-unguided missiles. We maintain our speed, perhaps change lanes, and do what we can to get away. We blame them for everything that goes wrong. Their fault we're sitting in traffic. Spilt coffee? Their fault. Elevated heartrate? Yep. But are they deserving of our most pointed vehicular disdain? This 400k Lexus LFA was recently spotted at Herb Chambers in Sudbury, MA. Super rare car, no question. 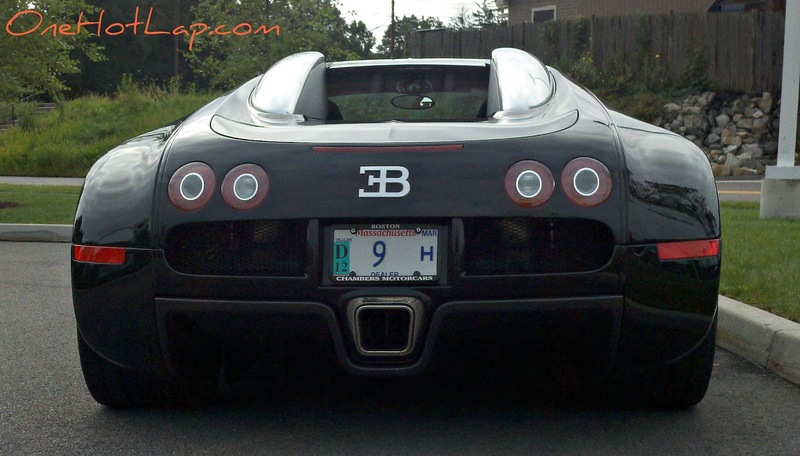 What I really want to know, though, is how you get the # 1 license plate in MA. According to Wikipedia, Massachusetts and West Virginia were the first states to issue plates, in 1903. So at least in theory, this makes it the oldest license plate in the entire U.S. I think the plate should have gone on an American car. It would look really good on a Viper SRT10!